Mediterranean, Canary Ids. Possibly Caribbean. Upper: Elysia timida feeding on an Acetabularia. Baie de Peyrefitte (French / Spanish Mediterranean border), depth 2m, 23 September 2000. Photo: Patrick Heurtaux. 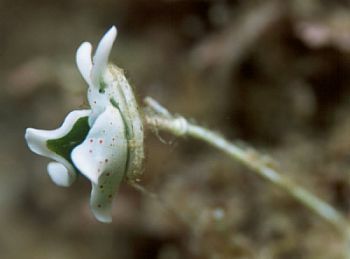 Elysia timida is considered to be a Mediterranean endemic which feeds on the green alga Acetabularia acetabulum in Spring and Summer, but in the early Autumn (September) they begin to associate with Padina pavonia. It retains functional symbiotic chloroplasts from its food within the cells of its digestive system. Usually has large red or orange spots on parapodia, head and rhinophores. See Erwin Koehler's Mediterranean Slug Site for a collection of photos showing colour variability in this species. See Elysia cf. timida Page for records of this species, or something similar, from the Caribbean. • Risso, A. (1818). 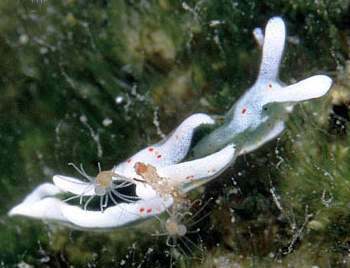 Memoire sur quelques Gasteropodes nouveaux, Nudibranches et Tectibranches observes dans la mer de Nice (1). Journal de Physique, de Chimie, d'Histoire naturelle et des Arts, Paris 87: 368-377. • Marin, A., Ros, J.D (1992) Dynamics of a peculiar plant-herbivore relationship: the photosynthetic ascoglossan Elysia timida and the chlorophycean Acetabularia acetabulum. Marine Biology. 112: 677-682, Figs 1-10. Elysia timida from Fethiye Bay, Turkey.